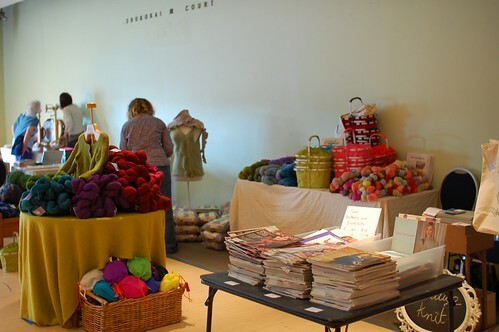 Saturday was the Downtown Knit Collective’s Knitters Frolic – an annual event that always has me clutching my wallet! This year I drove down (which is an accomplishment if you know me! I hardly ever drive) and worked with megan at our lettuce knit booth. We actually had a double-booth space because the people next to us cancelled. We had a great time! 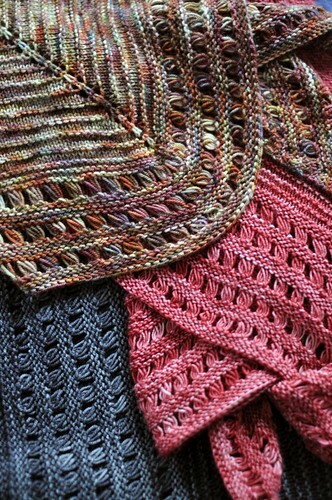 We had lots of Dream in Color Classy on display along with a great February Lady that Kate knit for us. 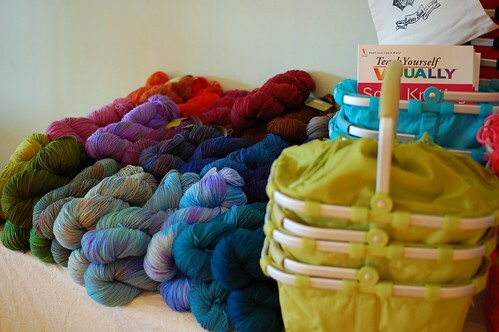 We also had lots of Socks that Rock, Malabrigo (and my Ruffles pattern), Dream in Color Smooshy, and the hit of the day – these awesome baskets from Reisenthal! Once a couple people bought them, they told us that everyone was asking where they came from! We ended up selling out completely – awesome. I didn’t even get one; I’ll have to wait for the next shipment. Part of what’s so fun about the Frolic for me is seeing so many people I know all in one place! It was super busy first thing in the morning – I guess everyone wanted to get there bright and early. For atmosphere, the view in one direction from our booth. 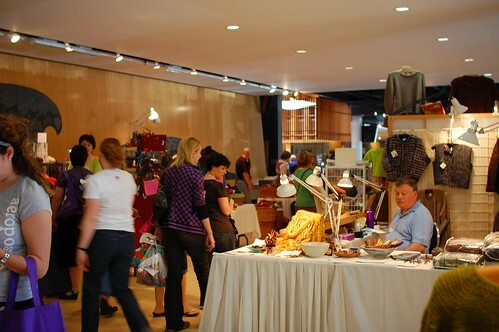 If you’ve never been, this is just one small area – there’s quite a few vendors. Of course, I did get a bit of a chance to shop once it quieted down a bit. 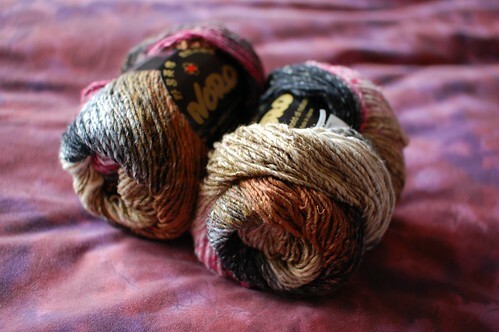 I’m saving my fibre-buying for MDSW (which is next weekend! how did that happen so fast?) but I had a bit of a falling down at the Tanis Fiber Arts booth. 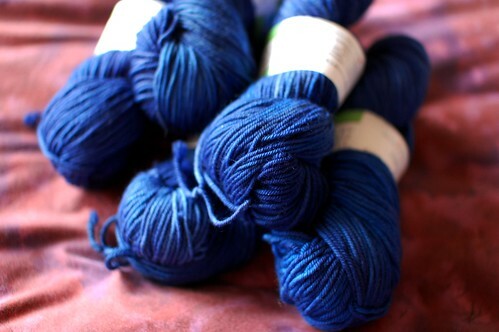 I bought a sweater’s worth of the aran weight in “midnight”. 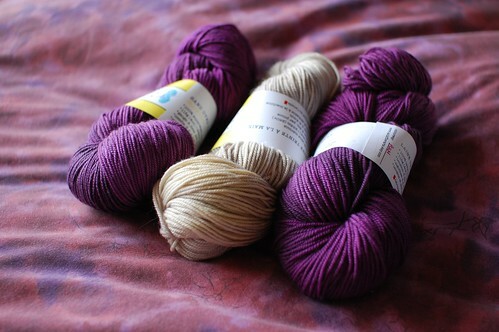 I also picked up a couple skeins of DK weight in “plum” and “sand”. A copy of “Hands-On Rigid Heddle Weaving” and a couple balls of Taiyo rounded things out. Okay, so these push the giant granny square slightly out of stashbusting territory, but in my defense, the Purple Purl had these on special! Should be enough for a couple more rounds of the granny square. Very last thing was a couple of bobbins – Majacraft bobbins. 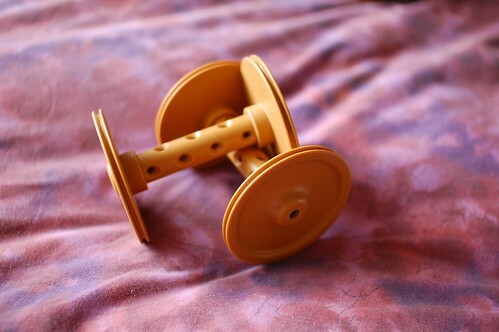 …I may have ended up with a new (to me) Majacraft wheel this weekend! I absolutely love those baskets! So stylish and fun! Wow !! I want this in my country !! I’m a little bummed. I was one of the many who was wandering around in the morning. It was my first ever Frolic and with a restless baby at my side and even that hint of a crowd.. it was a bit overwhelming. I guess I should have come by in the afternoon. In hindsight too, I think I would have been smarter to have left the kiddo at home and signed up for some workshops. 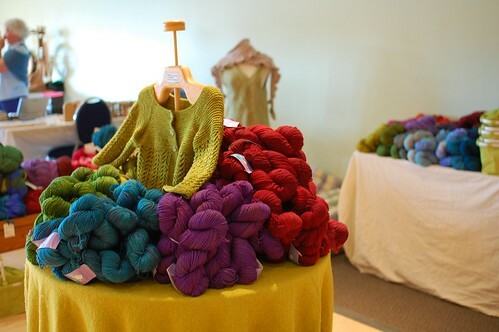 The yarn budget is so lean right now, I didn’t allow myself to buy much. Even with all that temptation!! It was great to see you on Saturday morning Laura! I heart Tanis’ stuff, she rocks. (And I’m glad she’s local for me!) Great stuff you got from her booth! So glad to hear you’ll be at MDSW! Are you coming to Guido’s official After Party?? Gosh you got a wonderful haul! I’m enjoying my rigid heddle, but I find that getting the cleanest finish and the nicest edges is still eluding me quite a bit. More practice is certainly what I need! Looks like lots of fibery goodness! Hopefully we run into each other at MDSW next weekend! You won’t be sorry you bought more Taiyo. I just finished my (total rip-off of your) Giant Granny Square, using 10 skeins of Noro Iro AND almost a sweater’s worth of worsted weight wool held doubled for a border. Mine is 62″ square after blocking, which is perfect for a sofa throw. In fact, I spent much of the afternoon wrapped up in it on a lounge chair in my garden.